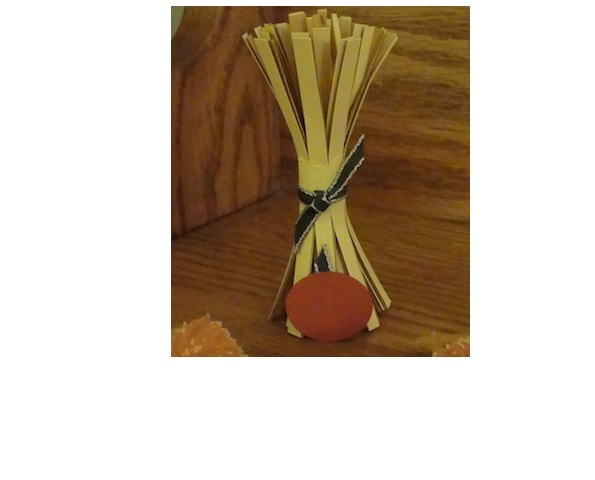 Just wanted to let those of you who follow me know that I have posted a tutorial for making the corn stalk bundle on my new blog. Here's the address if you'd like to check it out. Make sure to note my new address as well so you can continue to follow my posts. Please make note of the new address and become a follower of my new blog. Thanks! I think of myself as having a casual/informal personality and my decorating/entertaining style tends toward the cute and clever. The Thanksgiving table setting I created for today's SUO Challenge reflects these tendencies. Let's look at each of the components. The first piece is the napkin. Did you know that you can run napkins through the Big Shot for a big WOW factor? I showed this technique to my customers at my last event and they were "impressed" (pun intended!). I made the napkin ring by running a piece of Autumn Spice Designer Paper through the Big Shot with the Perfect Setting die, using the straight piece. I then measured around my napkin (after folding it the desired way) and trimmed to fit. I cut a piece of Early Espresso card stock the same length and a little wider than the die cut card stock, and mounted the designer paper onto the Early Espresso card stock, then folded it around the napkin. I attached the two ends using Sticky Strip for a good hold. The leaf is stamped using Cajun Craze ink and the single leaf stamp from the Day of Gratitude stamp set. I stamped on Very Vanilla and then cut out the leaf. I punched a circle from Early Espresso card stock using the 1 1/4" circle punch and mounted the leaf on this circle. A small bow made of Early Espresso 1/8" taffeta ribbon was added as a finishing touch. This cute little turkey was an idea I saw on another demonstrator's blog. How adorable is this little fellow?? Wouldn't he be so cute sitting by a place setting ready to welcome each person to the table? I won't go into detail about how he is made, you can click on the link above for directions. I did make two changes however...I used the Heart to Heart punch for the legs, cutting the tallest heart in half (and didn't use toothpicks) and also added the hat (done by free hand cutting). This corn stalk idea was my own creation. I have always liked the look of the corn stalks when they were placed in fields this way, and wanted to see if I could make one with paper. These would be a great idea for holding name/place cards. I will post a tutorial on how to make these in the very near future. The pumpkin is punched with the 3/4" x 5/16" oval punch in the Holiday Mini catalog. The stem and ribbon around the stalks is the 1/8" taffeta Early Espresso ribbon. Well, that wraps things up for this challenge. Thanks so much for stopping by. I hope that you gained some inspiration from your visit today. Please make sure to stop by and visit the other design members at the SUO Challenge blog and see what they've been up to. Also, please take some time to play along and upload your Thanksgiving Table Setting creations to the SUO Challenge Blog. Here are the cards for my second Stamp-A-Stack on November 19 and 20. Local customers should have received a personal email with all the details and how to register. It was fun to create this punch art card. Photos of pumpkins used as flower vases are favorites of mine, and I wanted to create that with this card. Here are the details of the card. Thanks for stopping by for a visit. Sorry this post is so short, but it's late tonight as I write this post and I'm off to bed. Blessings to you. Here are the card choices for my Stamp A Stack being held on Wednesday, November 10. This is an event being offered to my local customers. Please let me know the quantity of each card you'd like to make, and whether or not you'd like envelopes to be included. Okay - this challenge was really a challenge for me! I chose to use waffle paper, and when my order arrived I was certainly stumped. Fortunately, there are others who also share their wonderful cards and ideas online, and that's where my inspiration came from. In my blog surfing I've seen waffle paper made into flowers, bows, pleated, ruffled, punched etc. but that really wasn't my style or the effect I wanted to try. One day I came across someone who had run the waffle paper through the Big Shot with an impressions folder and that sparked my creativity. Here's the result I came up with. As you can see below, I loved the effect so much that I also line the inside of my envelope with the textured waffle paper. Thanks for stopping by to check out my SUO Challenge. Please make sure to visit the other design team member blogs to see what they've come up with this time around. Also, I hope that you will take time to share your creations at the SUO Challenge Blog. Fall is my FAVORITE season...I love all the earthy colors and hues! 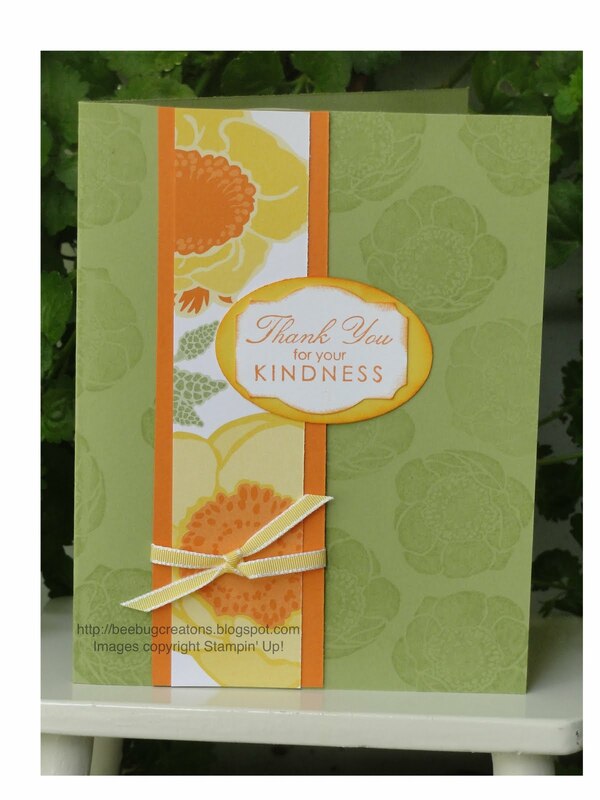 So, it's no surprise that I chose the Autumn Spice designer paper from the Holiday mini catalog for this challenge and used it along with the Day of Gratitude stamp set. The card is pretty easy to understand. I ran the Autumn Spice designer paper through my Big Shot using the lattice folder (I wanted the "popped up" side to be down, so I reversed the way I put the paper through). Then, I sponged the edges with Early Espresso ink. After stamping the sentiment and acorns on Very Vanilla card stock, I sponged over the images with So Saffron ink. It created a nice glowing effect. That's it in a nutshell (pun intended). Thanks for stopping by today and be sure to check out the SU Only Challenge blog to see what my fellow design team members came up with for this challenge. Here's the second "Big Shot" project...the one that I didn't submit for the SUO Challenge earlier this week. I purchased the Movers and Shapers die for the Big Shot this fall and LOVE the little window that gets cut out of the card! Here's the card recipe: Crumb Cake card stock for base; Old Olive card stock, ink and satin ribbon; Autumn Spice designer paper; Days of Gratitude and Tiny Tags stamp sets. Hello, and welcome to our second challenge on SUO Challenges. This time, we were to make a project using the Big Shot...I actually made two. Today, I will share the one I submitted and save the other for another day. I used the Baskets and Blooms die with a sheet of Autumn Spice designer paper from the Holiday Mini. I'm finding that this paper ALWAYS results in a WOW project. I constructed the basic unit with directions I found here. This is the same design I used for the tropical beach basket I made in July. 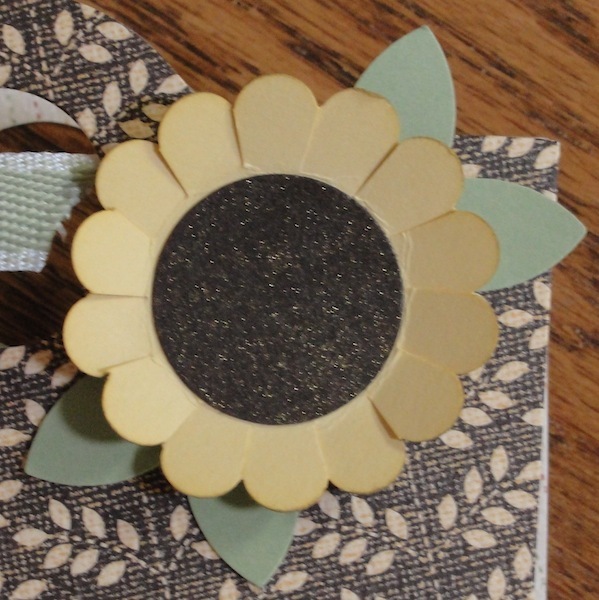 The flower was made with the original SU scallop circle punch. I inked the circle edges with So Saffron ink. The center is punched from Early Espresso card stock using the 1 inch punch, then sprayed with Gold Glow Smooch Spritz to give it a shimmery look. The leaves are punched out of Pear Pizzazz using the 5-petal punch. After I attached the flower center, I took my snips and cut each flower petal and gently bent them upward. Here's a close up of the tag I created. 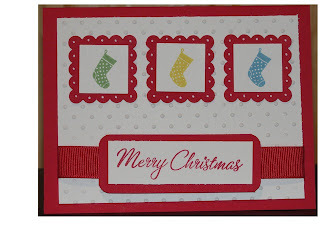 I used the Tiny Tags stamp set, Tiny Tags punch and the smallest of the original oval punches. The ribbon tied around the basket handle is Pear Pizzazz. The sentiment is stamped in Early Espresso ink and I used Pear Pizzazz ink and paper on the green vine. I used a self-adhesive pearl as well. So there you have it - my project for today's challenge. I invite all of you to stop by the SUO Challenge site and see what the other team members came up with. We'd LOVE it if you'd play along with us as well!! 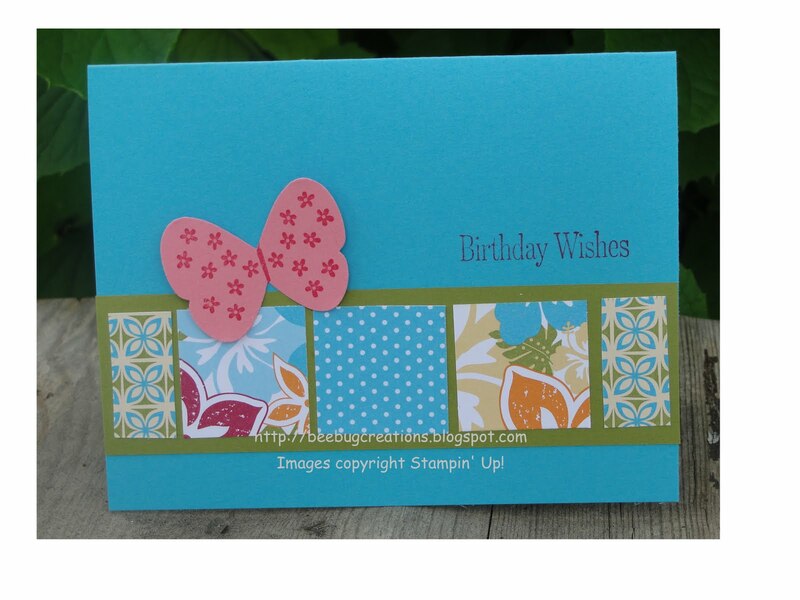 Remember, projects must use all Stampin' Up product (either current or retired merchandise). Thanks so much for stopping by to visit. Leave me a comment to let me know you were here. Here's a simple card that I created for a card swap I was part of last month. 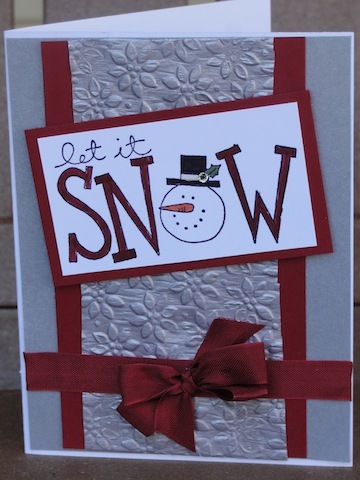 It uses a new set that Stampin' Up! introduced this year...Uncharted Territory. 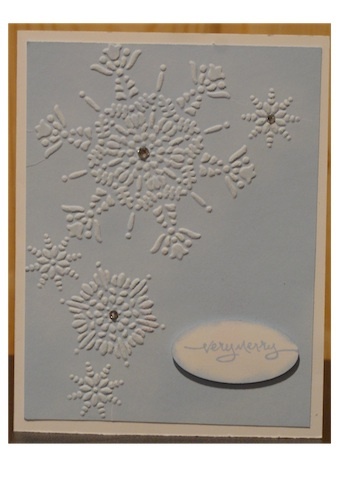 The card base is Crumb Cake, and the image and sentiment are both stamped with Crumb Cake ink on Very Vanilla card stock. The edges of this card stock have also been sponged. 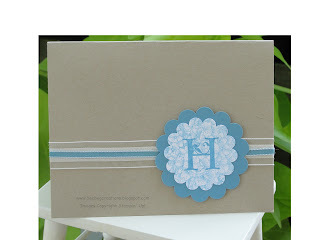 Baja Blue is the matte color for the image, as well as for the paper ribbon I created with the new punch. Thanks for stopping by for a visit today. Make sure to pop over to the SUO Challenge site and post your projects. The theme for this challenge is FALL and we'd love to have you play along! Here's another card that I created using the hostess set "Because I Care" as a background stamp. 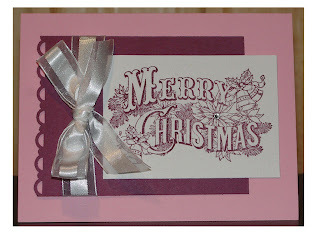 The card base is Pretty in Pink, and the hydrangea was also stamped in this color, then punched as a square. The single flowers in the squares were stamped in Rose Red ink (flower stamp in hostess set). 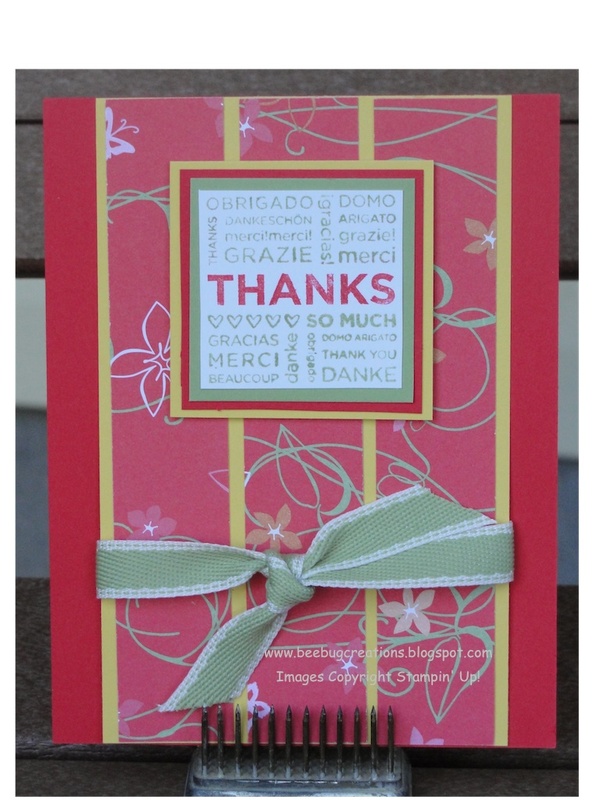 The scallop squares and scallop border strip are Rose Red card stock. The sentiment (Heard from the Heart set) is stamped in Rose Red ink. The white border is stamped with another stamp from "Because I care". I really like the subtle background that is created with this stamp set. So glad you popped by for a visit. Take time to leave me a message. Bet you can't guess what set I used to make these two cards. Look closely at the scalloped circles the monogram letter H is on...Give up?? I used the Level One hostess stamp set "Because I Care." After stamping the floral image, I used my scallop circle punch. Doesn't it make a great background stamp??! Both cards use Crumb Cake card stock as a base. The top one uses a small strip of DSP from the Elegant Soriee pack. The ink for the flower was Crumb Cake and the darker brown card stock and ink is Soft Suede. The blue card uses Marina Mist ink for both the flower and letter and card stock for the larger scalloped circle. 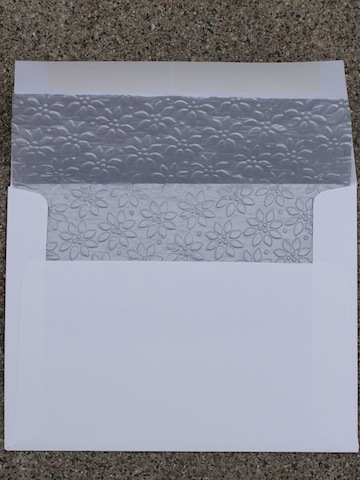 This card also uses Whisper White organza ribbon with Marina Mist 1/8" taffeta ribbon layered on top. The solid scallop circles were punched with the Extra-large scallop punch. I love that we can now layer two scalloped circles!! 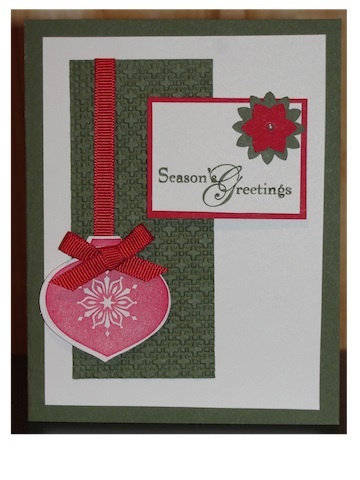 This card was created for one of my card making events. 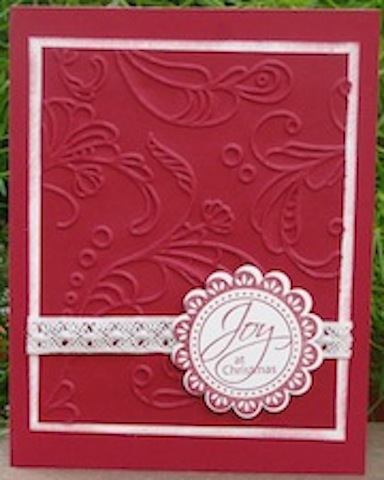 It uses the "Just Believe" stamp set...one of my ABSOLUTE favorites from the new catalog. The card base and base for stamped image is So Saffron. I stamped the image with the new Cajun Craze ink. I really am pleased with this color combination. The dotted paper is Cajun Craze DSP and the ribbon is Old Olive Satin Ribbon. I also used the ticket punch on the corners. I'd like to apologize for my lack of posts lately. We've had lots going on and I just haven't had time. My son left for his first year of college two weeks ago, then school began here and it was back to work. It seems every day is filled to the brim with busyness. I hope to be more regular at posting. 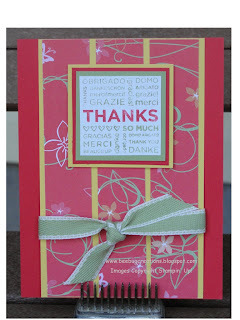 Today I'm sharing two cards made with the single SU stamp "So Many Thanks". Both cards are the same layout but have two entirely different feels. The first one uses Pear Pizzazz as a card base, the other Poppy Parade. Both use DSP from the Sunny Garden collection. Card stock colors the DSP strips are mounted on are Peach Parfait and Daffodil Delight (the DSP strips are 1 inch each). The ribbon is 1/2 inch Stitched Poly Pear Pizzazz. 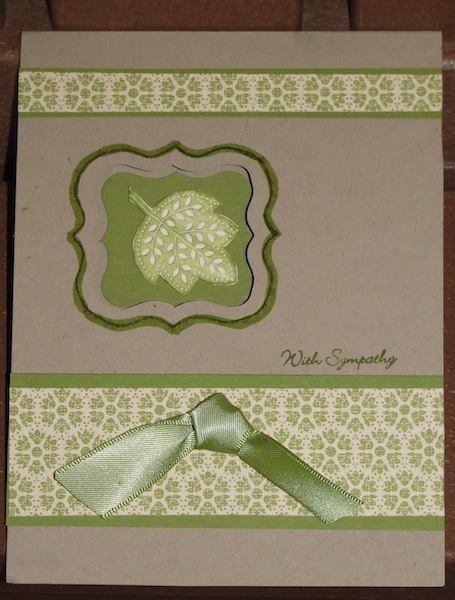 The green card uses Pear Pizzazz ink stamped on Pear Pizzaz card stock. I added a self-adhesive basic rhinestone for some glitz. I used markers to ink the image on the red card. Hope you enjoyed the cards. Thanks for stopping by for a visit. Welcome to the first SU Only Challenge...with a theme of Fall. So glad you stopped by to visit. Fall is one of my favorite times of the year. I work in the local school district, and although I enjoy having my summers off, I like the comfort of resuming the school year routine. Now it's your turn. We'd LOVE to have you play along with us and share a fall themed project. Just link it here. I'll be joining these FABULOUS team members: Michelle Laycock, Karen Barber, Jenn Diercks, Amy Fink, and Cindy Coutts. Please help spread the word and make sure to stop by September 7 and play along with us! I just received the Uncharted Territory stamp set and can already tell it will be a "go to" favorite. This is my first card inked using Pacific Point and I think that will be another new favorite. 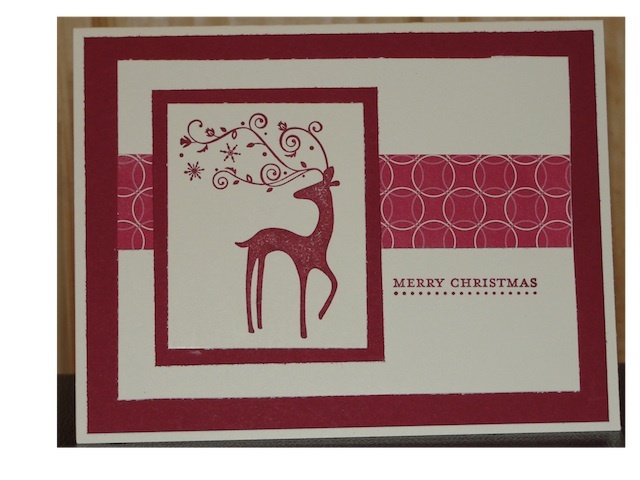 The top half of the card base is from the Blueberry Crisp designer paper pack. Ribbon is Very Vanilla 1/4 inch grosgrain. We've been busy sorting and rearranging around the house. It's been a HUGE project and will be glad to have it done. Definitely has cut into my "being creative" time, but need to do these things in the summer when school isn't in session. When school begins again and my husband and I go back to work, we just don't have the time or energy to tackle the "big" jobs. Thanks for stopping by for a visit. Always appreciate it...feel free to leave a comment. Can you stand just one more?? 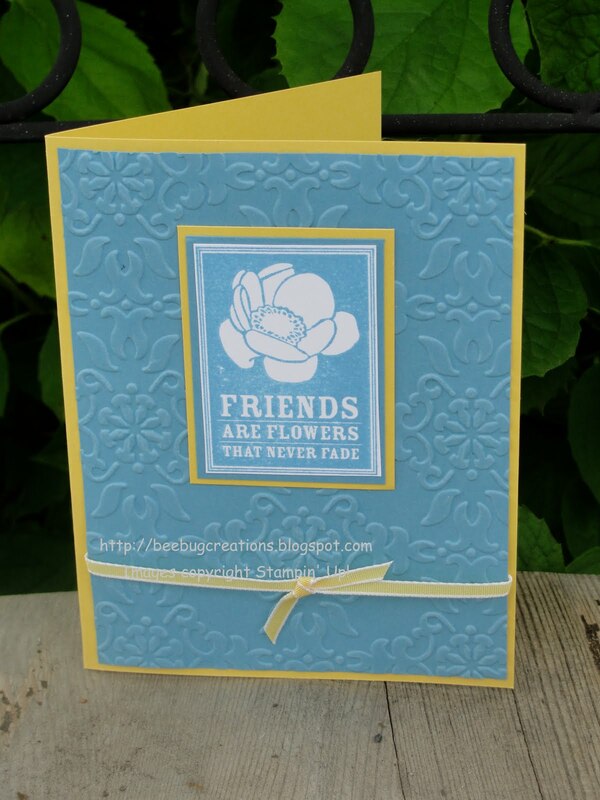 The Friends Never Fade cards I have posted the last several days were also samples I created for my open house. I'm about to begin my second year as a Stampin' Up! demonstrator, and I have decided to try something a bit different this time around. It seems last year, I purchased/earned stamp sets that I never really had a chance to get to know. This year, I'm making a real effort to make several cards with each stamp set shortly after I receive it, just to play with the stamps and get a feel for the set's "personality". The fun thing about the Friends Never Fade set is that it coordinates so beautifully with the Garden Gala designer paper and makes into a gorgeous card! 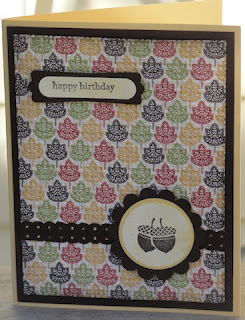 Yet another card to show the versatility of the Friends Never Fade stamp set and Garden Gala designer paper. Sentiment is from the new Level 3 Hostess Set Occasional Quotes. 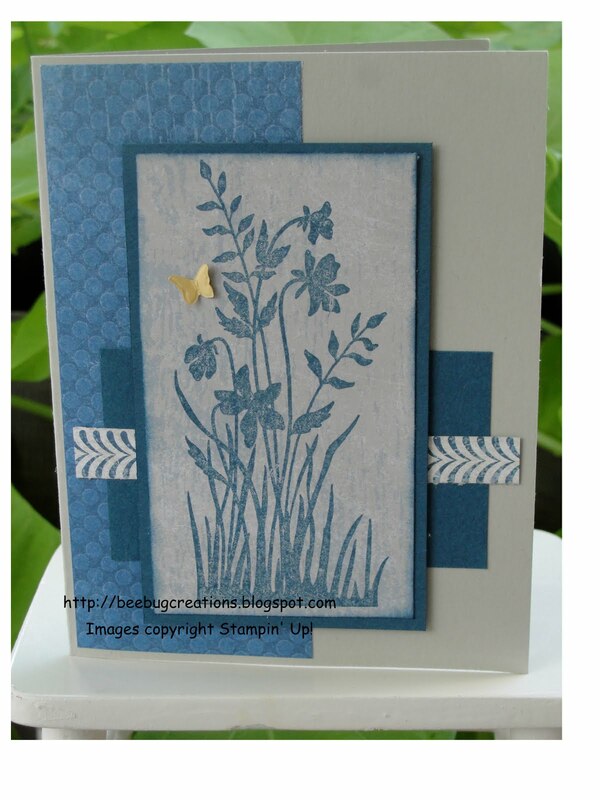 Card base is Cherry Cobbler, which I think makes the yellow Daffodil Delight and blue Marina Mist really pop! 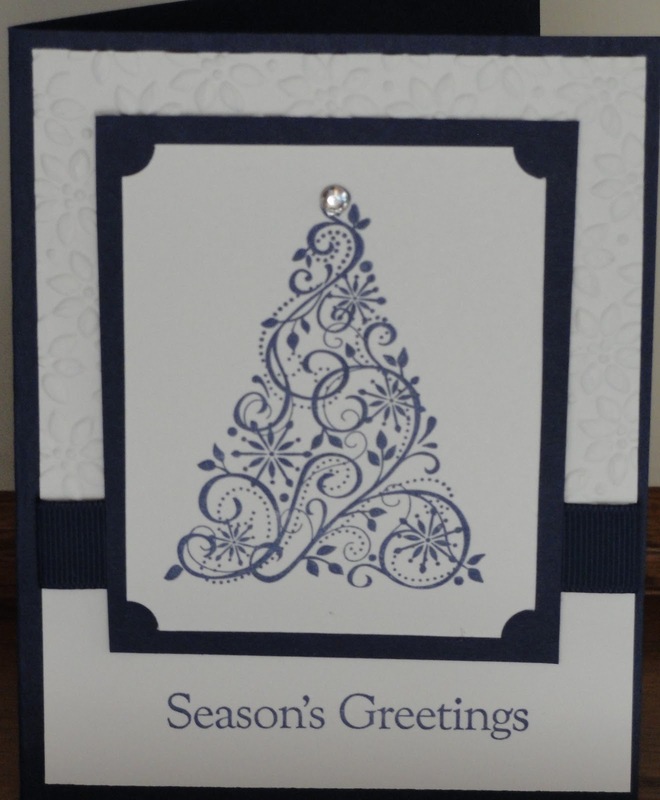 I love the ease with which designer paper can enhance the look of a card. The flowers are stamped with the new Cherry Cobbler color, then trimmed with scissors. The leaves are punched using the large bird punch. The designer paper is from the Garden Gala pack. 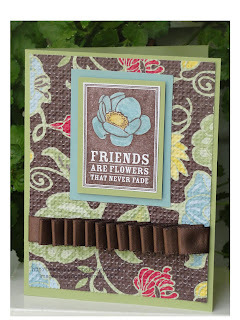 The Garden Gala designer paper is the perfect companion to the Friends Never Fade stamp set. I ran the designer paper through the Big Shot with the lattice square texture folder. I accidentally ran it through so that the raised bumps were on the opposite (wrong) side of the paper --- OOPS! ---- but then decided I liked the weathered look that the indented impressions gave to this pattern. I found time to try one more challenge with my new Stampin' Up! goodies. 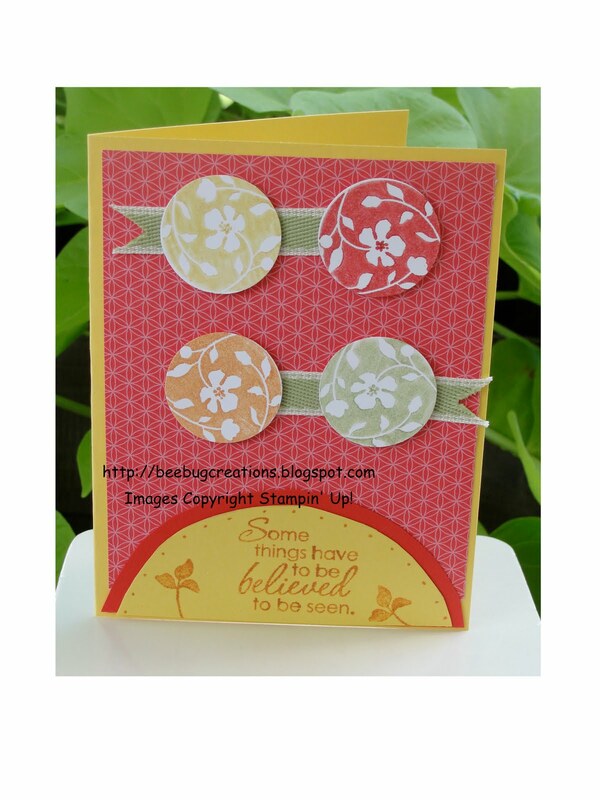 Again, I used the "Just Believe" stamp set along with three of the new In-Colors and Sunny Garden Designer Paper. 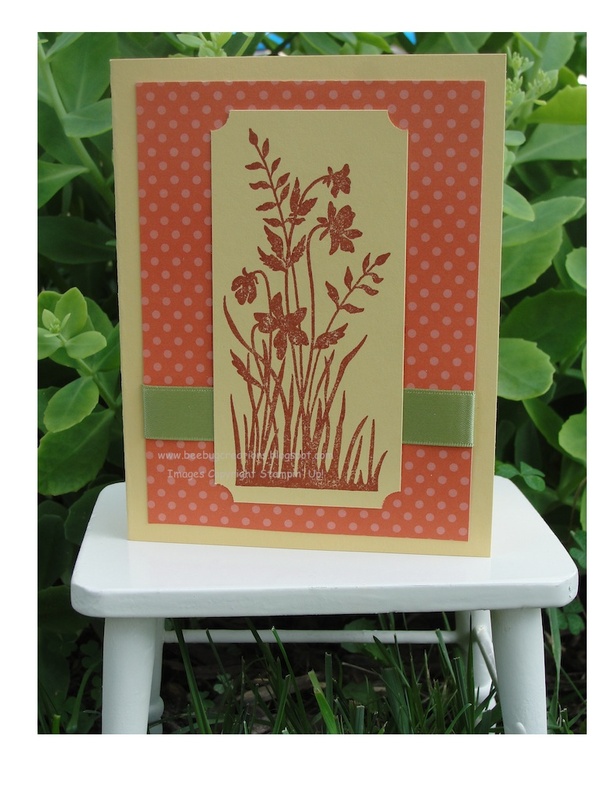 The card base is Daffodil Delight and I attached a piece of Designer Paper from the Sunny Garden set. The circles were stamped with Daffodil Delight, Pear Pizzaz, Poppy Parade and Peach Parfait, then punched with a circle punch. The ribbon under the circles is 1/2" Stitched Poly Pear Pizzaz. I traced and free cut the bottom circles (Poppy Parade and Daffodil Delight). I stamped the sentiment and leaf images in Peach Parfait. This was a fun challenge, and great way to try out my new stamp set. Thanks for taking time to look! This has certainly been a busy week for me. Thank goodness I discovered how to do automated posts!! The open house went wonderfully well and everyone who came seemed to have fun. 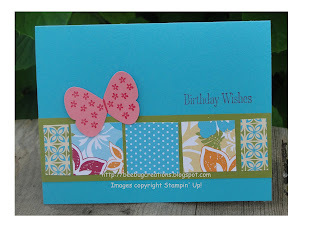 My order of NEW Stampin' Up! products came just in time for me to display them. I ordered the "Just Believe" stamp set, and when I saw the weekly challenge at Techno Stamper, I knew just what I wanted to do. 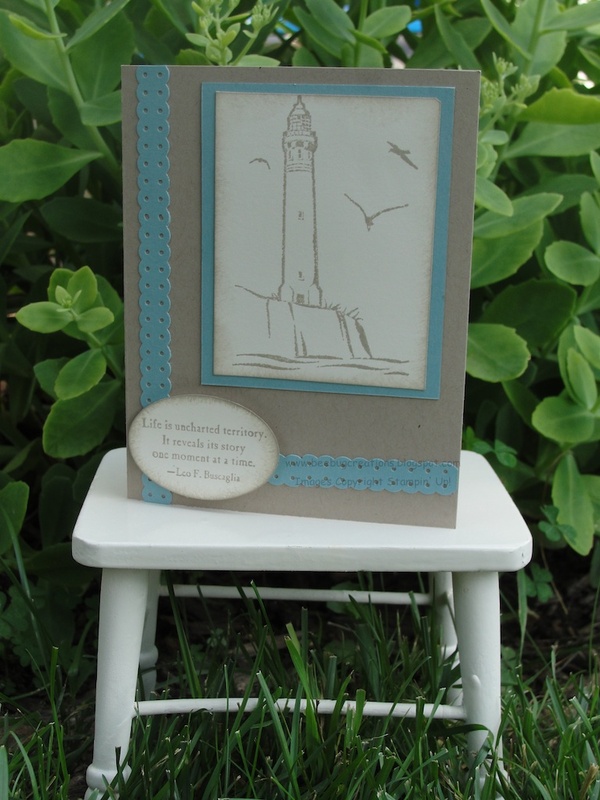 Here are the details: The card base is Sahara Sand. 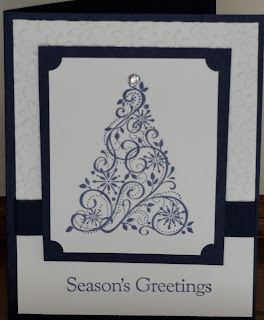 The image is stamped using Not Quite Navy ink and the paper that I used was from the Blueberry Crisp Designer Paper Set. I sponged the edges with the same ink. The long blue pattern piece attached to the card base is from that same pack. The solid blue is a piece of Not Quite Navy card stock. I used paper instead of ribbon, and it is also from the Blueberry Crisp pack. I sponged it with Sahara Sand ink to tone done the brightness of the white. 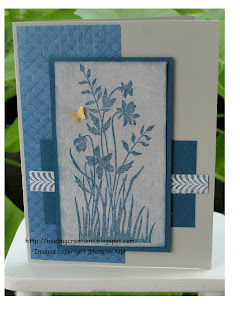 When I got that call done, I decided the card needed a "pop" of color, so a cut a butterfly out of Daffodil Delight using the Beautiful Embosslits die. This was a fun card to make. I LOVE the way that it turned out and this might be a card we make in one of my monthly classes. Thanks for taking the time to stop by. I always appreciate it! I think the Friends Never Fade stamp set is a very versatile one. I've been wanting to play with this set and have seen some lovely cards made with the stamps. My inspiration for this idea came from Sharon Field I made a few changes of my own. The green card stock that I used was Certainly Celery. If you had been at my home yesterday for the Open House, you could have made one of each of these cards. The first one uses the palm branch stamp from Tropical party and tropical designer paper. This second card uses squares of tropical designer paper, as well as a butterfly image from Flight of the Butterfly and a sentiment from the new Level 3 Hostess Set Occasional Quotes. 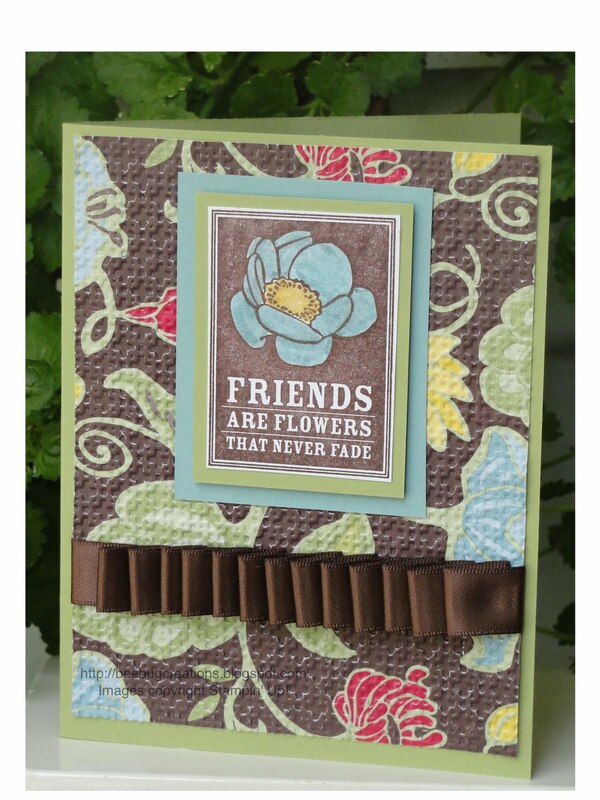 This last card uses an image from the new stamp set Friends Never Fade. Other new products include two of the new colors - Daffodil Delight and Marina Mist. I can already tell these will be favorites of mine!! Well, that about wraps up all the tropical posts for now. Hope that you didn't get too tired of them. Thanks for stopping by for a visit. Happy Stamping! If you lived in my area today, you'd be able to stop by my home for the New Catalog Open House and some stamping fun. 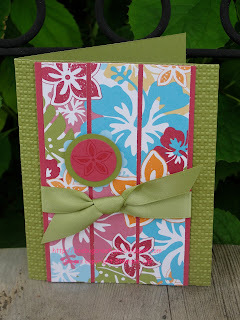 All the tropical card samples I have posted on my blog will be on display. 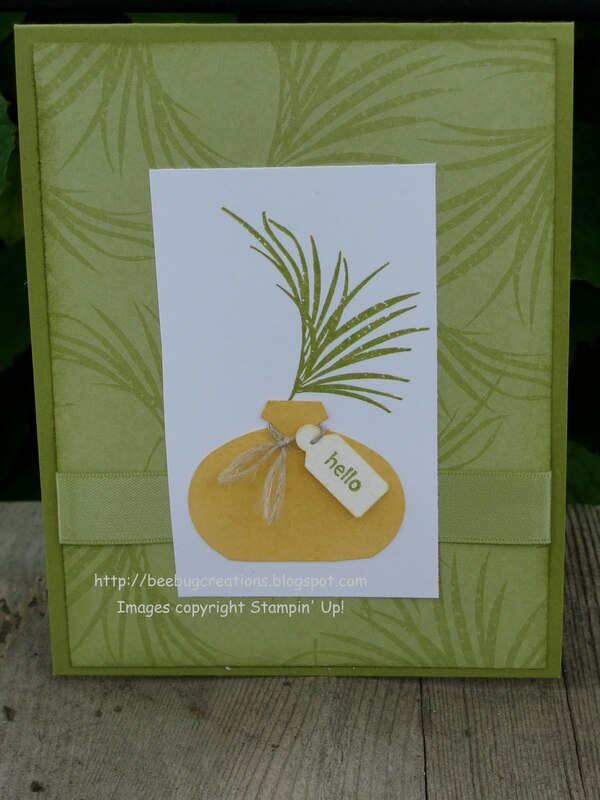 There are make-and-takes for all to make, door prizes, retired Stampin' Up! product for sale, new catalogs for browsing and OF COURSE....goodies to enjoy. This card was a CASE of the card found here. 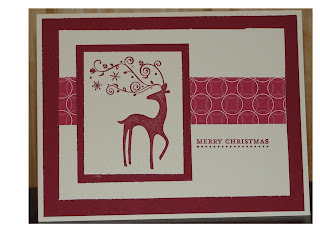 The designer paper gives a nice bright look to this card. Aren't these the CUTEST little items you've seen in awhile? I thought so and that's why I tried my hand at making them. I found directions for the tiny purses here and the straw hat and bag here. I think it's fun to make cute things like this. 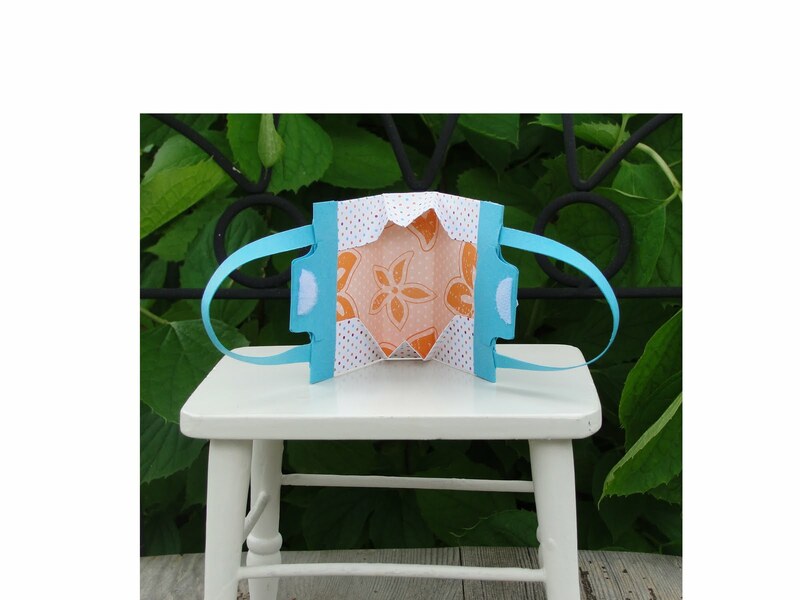 The square lattice folder makes the paper look just like a straw purse. The flower lei idea came from a post on Angie Juda's blog. I wanted to try creating the lei wreath, and when complete, decided to make it into a card. Flowers are stamped with Rose Red and Tempting Turquoise. 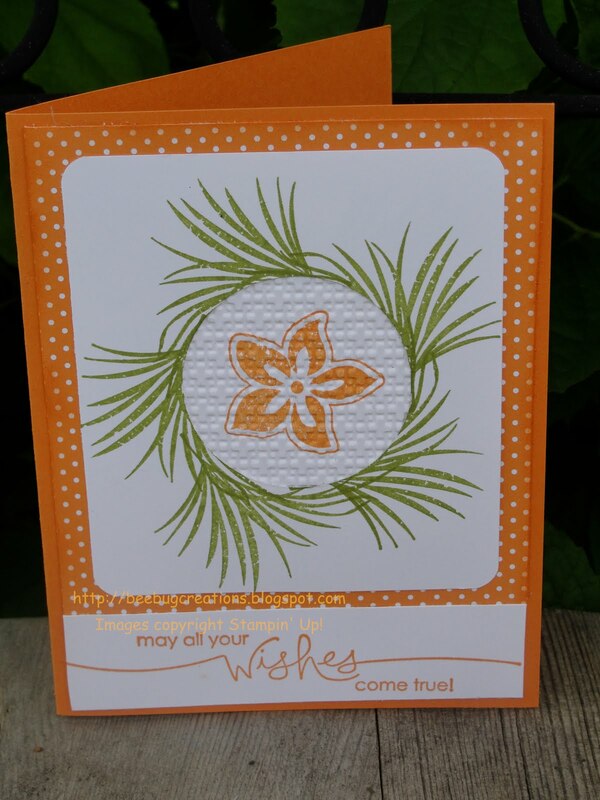 Card base is So Saffron, and I stamped tropical images in So Saffron ink around card edge for a border. 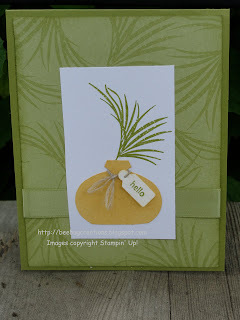 The grass skirt card was an idea borrowed from Marie at Stamping Inspiration. My card certainly isn't as involved as hers, but it will give my customers an additional tropical card idea. 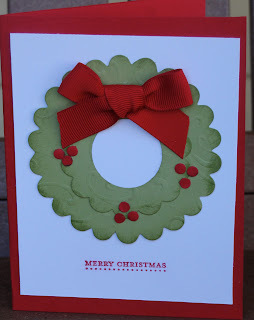 The card base is Old Olive card stock. I cut another strip of Old Olive to use for the grass skirt and just adhered the top of the card stock to the card base. This leaves the grass part of the paper free to move. 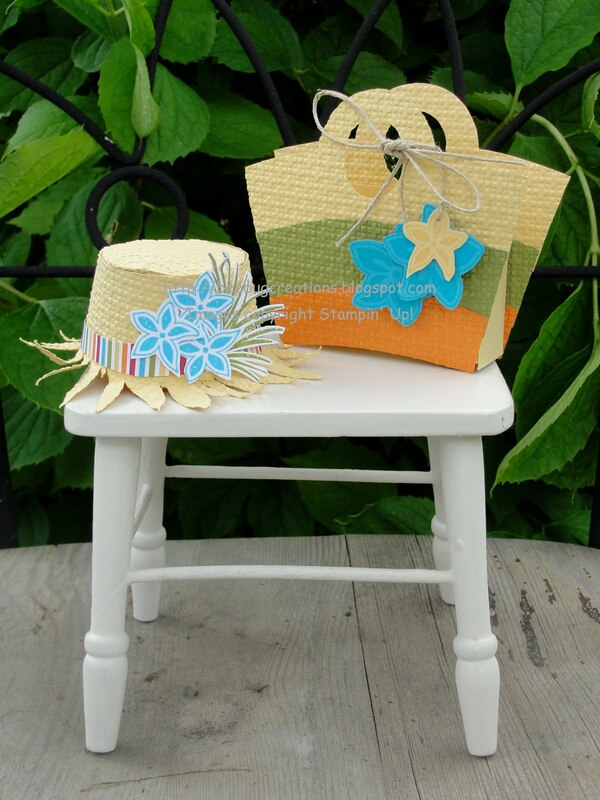 Two different tropical designer paper designs were used as well. 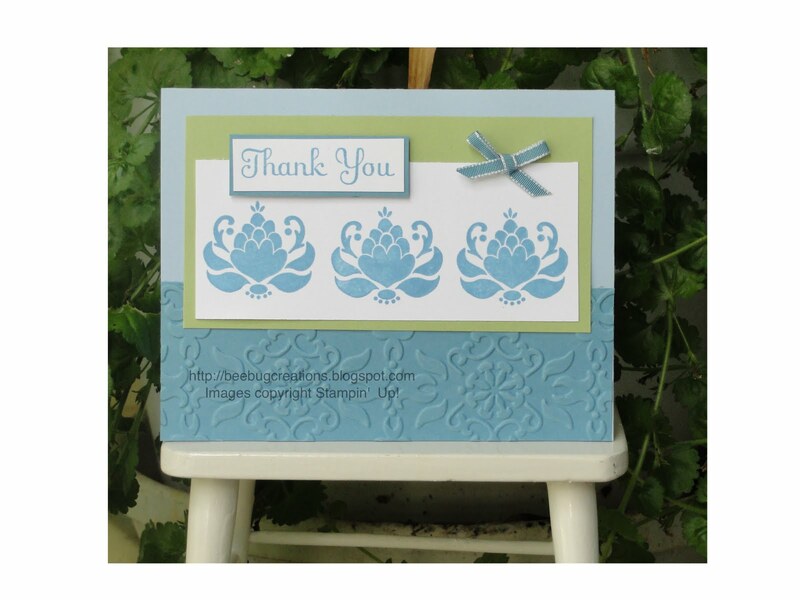 Stamped sentiment is from the Perfect Punches stamp set on page 131 of the NEW catalog. I saw this card and knew that I wanted to replicate it. What a great all-occasion card!! My card base is Old Olive card stock. I matted a piece of tropical design paper with palm branches on top of the card base. The palm branch is stamped on Whisper White with Old Olive ink. The vase is punched from So Saffron card stock using the ornament punch and trimming the bottom off. I then sponged the vase with So Saffron ink to give it a speckled appearance. 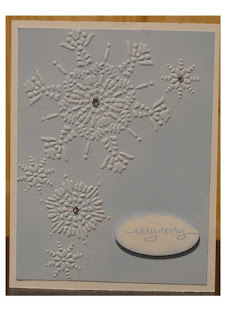 The sentiment is from Tiny Tags, stamped on Whisper White with Old Olive ink, then punched out with the Tiny Tag punch. I also inked the edges with So Saffron. The idea for this bright card came from here. I really liked the way Dawn had made her wreath using the palm leaf, as well as the textured piece she tucked behind the center cut out circle. Thanks for visiting my blog today. Hope your day is full of WONDERFUL! I'm so glad that you stopped by to visit. I hope you enjoy looking at my creations. I'd love it if you'd leave a comment and let me know you stopped by! I enjoy creating with paper and love to try new projects. Besides card making and scrap booking I like to read and garden. I have been married to my wonderful husband for 27 years and we have a 18 year old son. Our family also includes two dogs - Ladybug, a 12 year old West Highland Terrier and Diesel, an energetic English Springer Spaniel. The content of this blog (including photos, text, ideas and project design) is my sole responsibility as an independent Stampin' Up! demonstrator. The use and content of the classes, services, or products offered on this blog is not endorsed by Stampin' Up! This blog is intended for inspiration and personal use only. Please do not copy content for publication or contests. Thank you.